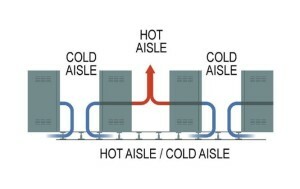 In mission critical facilities, the hot aisle/cold aisle layout has quickly become the established method for cooling. In a cold aisle, the racks on either side are arranged so that their fronts face the aisle. Perforated floor panels are placed in the cold aisle to allow the conditioned air to come up through the raised access floor supply air plenum and into the fronts of the sensitive electronic equipment. In a hot aisle, the racks on either side are arranged so that their backs face the aisle. No perforated panels are placed in the hot aisle. The conditioned air then passes through the equipment, naturally increases in temperature, and is released through the back of the equipment rack into the hot aisle. The return air then rises and makes its way back to the computer room air conditioning (CRAC) unit. The cold aisle must be two access floor panels wide and only have the number of perforated panels that the heat load requires. Cable cutouts must be sealed properly in order to increase static pressure and prevent bypass airflow. Blanking panels must be placed in the racks to prevent recirculation. Rows of equipment must be laid out perpendicular to the face of each CRAC unit to minimize recirculation. There must be at least three feet of unobstructed clearance between the top of each rack and the top of the return air path back to the CRAC units. If done properly, the implementation of the hot aisle/cold aisle best practice will maximize the delivery of conditioned air to the equipment, reduce recirculation, keep conditioned air and hot return air separate, and—most importantly—increase the efficiency of your mission critical facility’s cooling equipment. Of course, implementing the hot aisle/cold aisle best practice is easily accomplished when a facility manager is first planning the mission critical facility space. But, it’s a bit more difficult when facing an existing facility that is filled with operating hardware. Here are a few tips to make the process a little smoother: Plan. Before you do anything, put your migration plan down on paper. This step is essential in ensuring an effective and efficient implementation. Establish the phases the work will be accomplished in before the process begins. And make sure that your facility has enough space to work with. Too often, managers are faced with complications that could have been avoided with proper planning. Whether the work will be completed by in-house personnel or contracted out. Make sure that you manage executive expectations concerning how long the project will take. 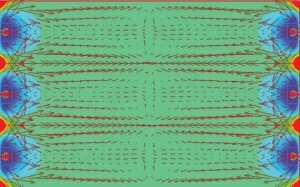 Each migration phase should have some contingency time incorporated to allow for unanticipated events. The contingency time should be greater in the earlier phases until the team builds experience and confidence. Your project will take place in phases. After each phase, conduct a review session to assess whether all of the work was completed, if it was completed within the timeframe, and what improvements should be made to the process during the next phase. And be patient. If work is done nights and weekends, converting to the hot aisle/cold aisle layout could take several years to complete. Communicate. Be sure to communicate consistently with your internal customers during the implementation stage. Focus on the details. It is important to remember that minor details can significantly affect your cooling efficiency. For example, a common error that we see is CRAC units being placed in the cold aisles instead of the hot aisles. 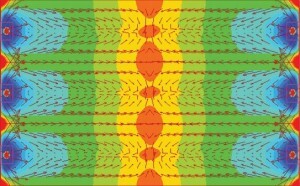 As you can see from the airflow analysis reports to the right, this detail can result in poor pressure and velocity. Cable distribution is another detail that is often overlooked. Remember that as racks move, the cable distribution located underneath the raised access flooring should move with them. When converting to a hot aisle/cold aisle layout, the cabling must be run in the hot aisle and be as close to the floor panels as possible. The hot aisle/cold aisle layout has become a requirement in order to ensure efficient cooling in mission critical facilities. With proper planning and scheduling, an implementation plan and review process, good communication, and attention to minor details, you can be sure that your transition to the hot aisle/cold aisle layout will be seamless. Bick Group has subject matter experts in this and many other topics. Talk to a Bick Installation Services expert by emailing: jcova@bickgroup.com.